Need help getting organized? Moving and need to downsize or just looking to upgrade from wire shelving? 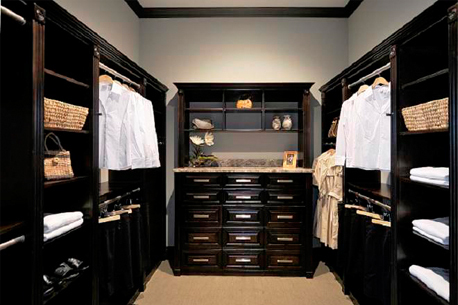 Let us help you design the most functional and efficient storage space including walk-in closets, reach-in closets, pantries, home offices, garages and more. Now offering Plantation Shutters and other window coverings! Call us for all of your finishing touches. No Gimmicks! We don't need "sale" prices and coupons; you've seen the ads offering free installation and up to half off your order. Don't fall for the discounted mark-ups. Support your local organization company! We give you the "LOWEST PRICE GUARANTEE." We guarantee our price is the lowest. If a competitor offers a similar design for a lower price, we will beat it! Call or email today to schedule your free in-home consultation. Included is a free 3-D drawing of your closet design. Now offering Plantation Shutters and soft window treatments. First Coast Closets & Window Fashions is a locally owned and operated family business founded in 2006. We are the sales force, designer and installer; we are A-Z. We arrive at your consultation, we design your storage space and we install your system. You can find comfort in knowing who will be in your home and trust that you are receiving quality craftsmanship. With our low overhead we can pass the savings on to you! Our service areas include: Jacksonville, Orange Park, St. Augustine, Ponte Vedra & Palm Coast. We have expanded our business to include Plantation Shutters by Island Shutter Company and hard/soft treatments by Norman International. We are your one stop shop for all of your finishing touches. We will find unique and efficient ways to help you organize and store everything you need without wasting space. When we arrive at your home, we will take an inventory of what you have, and listen to your needs, which will allow us to create the best closet organization system custom for you! Window treatments customized to yourspace, light preference and color!